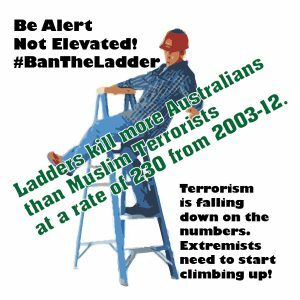 Calls to ban Muslim immigration are irrational and economically unviable since Australia’s Muslim community, and tourist visitors have brought peace and prosperity — not terrorism. Our Australian borders, “Girt by Sea”, apparently, require strict border protection. Is the Government’s security claim justified and should we ban Muslim immigration? In the light of fears expressed by Sonia Kruger and Pauline Hanson calling for a ban on Muslim immigration and Morrison and Dutton’s harsh detention policies for any desperate enough to approach our shores, justified? All despite no asylum seeker arriving by a boat ever being implicated in political terrorism in Australia! Yet “Reclaim Australia” adherents and government MPs keep raising the fear levels. They imply terrorists are trudging from country to country, risking life and limb in leaky fishing boats for the expressed purpose of carrying out terrorist acts. Hiding as victimized refugees defies logic, rationality, and common sense, especially when it is easier to fly in simply. This really this is seriously the type of expressed argument by politicians like Cory Bernardi, Jacqui Lambie, Pauline Hanson and George Christensen. The closest thing to any “Muslim terrorist” we have experienced in the last decade flew in on a comfortable plane on a business visa with the expressed approval by the conservative Government of the day. Granted a protection visa in 2000, Haron Monis became a citizen in 2004. Aside from having a criminal & psychological history and fallouts with the Australian courts for implications in crimes, it was evident that Man Haron Monis only thought of using the “terrorist” angle for his actions in the Lindt Café, as an afterthought. His request for an ISIL Flag to be brought into the cafe reflects the lack of intent of an organised act of terrorism, and is more accurately described as a “violent rampage by a narcissistic and mentally unstable man”. Perhaps we should stop cutting mental health programs as a mitigating effort? Even if you do consider this an act of political terrorism, (and let’s generously give it the widest definition possible), the death of one person (the police killed the other person) might bring the death toll due to “terrorism” in Australia to five. That number includes the 1978 Hilton Hotel bombing (which killed three) and perhaps adding the Turkish consul-general murdered in Sydney in 1980. Adding this murder as a “terrorist death” is stretching credibility. It’s hard to manufacture any numbers of significance for actual terrorist acts in this country. Of course the strict interpretation of section 100.1 of the Criminal Code’s definition of a “terrorist act” would suggest only the Hilton Bombing is relevant. If you count world-wide terrorist deaths of Australians killed since the 1978 Hilton bombing, then only 113 deaths are represented. At an average of 3 a year, frankly horses kill more Australians (at a rate of 20/yr). I curiously await the announcement of the closure of the horseriding, rearing and racing industry and sport. Really? <sigh> We tend to become hysterical about hypothetical possibilities, while inadequately dealing with more prominent causes of mortality. (i.e. women’s deaths from domestic violence). Australia spends billions on the negligible threat of “terrorism”, while our conservative government had reduced by $300 million the amount we spend on risk mitigation for domestic violence. Kate Stone reported 79 Women were killed last year yet while resources for domestic violence have shrunk, counter terrorism measures for the theoretical possibility of death, has increased by $1.2 Billion in 2016. Frankly, the most significant post World War 2 loss of lives on Australian shores due to a single individual was accomplished by a blue eyed, blonde, Caucasian (non-Muslim) man at Port Arthur named Martin Bryant in 1996. Before that, there was the Queen Street Post Office massacre by the Catholic Caucasian Frank Vitkovic who killed nine people (from which the term “going postal” entered the Australian vernacular). In the same year, 1987, the right-wing Caucasian non-Muslim Australian Army officer, Julian Knight killed seven people. In fact the more you examine the history of massacres in Australia (and in particular the ones before the World Wars), the more you realise the real profile of mass killers is very similar to the American experience. 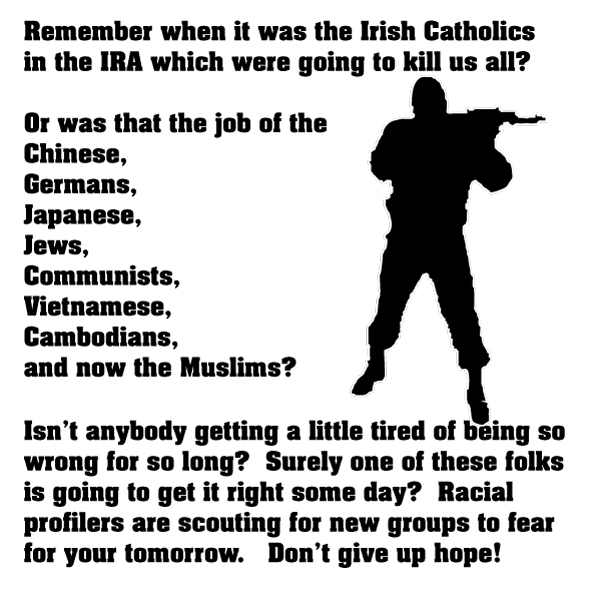 The lessons are, restore mental health programs and beware of white, Catholic, right-wing, non-Muslim Caucasians! We are content to ignore the fact that the vast majority of Muslims worldwide are peaceful law abiding citizens, who are more often the victims of radicalised elements within their society. 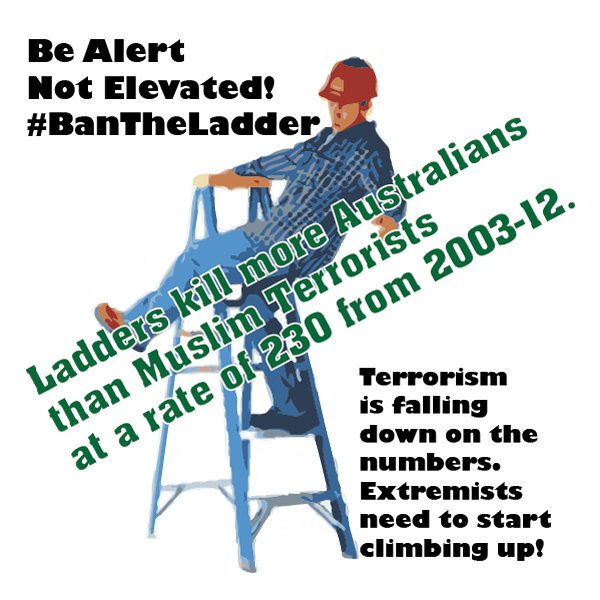 They have a greater risk of death by terrorism than any non-Muslim Australian. That doesn’t include deaths instituted by the Western government’s ‘war on terror’ which estimates have put at 4 million people. 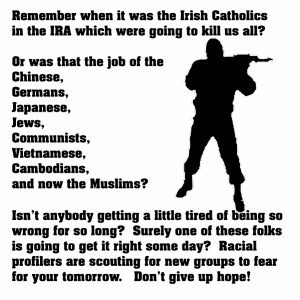 Yet death by Muslim terrorist rates as a fear that preoccupies our social media chatter, our racial vilification, our TV talk show conversations. Our irrational fear of barely 2% of our population who are Muslim (a third of which are Australian born) is odd in the face of so many other more fatal causes. Between 2003-12 the ABS recorded a few causes for deaths many of which were outlined in Crikey’s article. Still, we will spend billions on anti-terrorism. With the return of prominent racial vilification on the national political agenda with Hanson’s “One Nation” party returning to power, new calls for action have emerged. Would we oddly expect a person who is entering the country intent on doing us harm to answer honestly? Who would we then stop? How would Sonia Kruger’s ban be implemented? Muslims enter the country as refugees, immigrants, or for education, business or tourism. Refugees & immigrants, historically, add considerably to the economic welfare of our nation. Not only do this asylum seeker population NOT generate terrorist incidents, but they do create economic wealth in Australia (and not by taking jobs so much as creating them). The example of Karen refugees making $40m worth of contributions to the economy in Nhill, Victoria, is a classic case. Spending 1.2 Billion a year to keep them in detention, when they could be boosting our economy by millions is wasteful. So, if it is not refugees that are a threat, then what of the alternative group that fly in on a plane every year? Which industry in Australia are we prepared to damage to allay our fears? Of the 7.78 Million visitors to Australia, for reasons of holidays, business, employment or education; many originate from Muslim countries. While Tourism from Japanese has been decreasing, Asian and Muslim countries have been on a long running increase. Tourism Queensland has been marketing to Arab travellers for quite some time and definitely would find Queensland’s Pauline Hanson’s call for a ban, detrimental. International students contribute $19.7 Billion to the Australian economy and while Islamic students tend to concentrate their numbers at the Universities of Melbourne, Griffith and the Western Sydney, preventing Muslims from participating in Australian education would have a significant economic impact. If – like the Australian population – Muslims represent less than 2% of university students, then we might be discussing a $400M hit to our economy. Then there are the business and 457 visas, which facilitate Muslims entering the country for employment or trade. Trade for goods, services and technology with the Middle East & North Africa (MENA) is a $16 Billion industry. The question we need to ask is how much of the billions of dollars in tourism, education and business markets are we prepared to sacrifice or adversely affect? All this in the name of a hypothetical possibility, we haven’t seen actualised in 38 years? If we’d only stopped sabotaging funding for mental health programs perhaps we’d have less murderous events we like to call “terrorism”, inappropriately? To what extent will we lock out the Muslim world from Australia because of this disproportionate fear? I thought true conservatives sought to be prosperous, measure real risk rationally and be economically responsible? So why choose an economically irrational and highly expensive path based on an obscure risk with negligible statistical occurrences? Will the Coalition Government ignore it? « Growth Rate Indicators	» WTF Trump! ?